Reciprocity. Humans feel obligated to return favors and gifts, even unwelcome ones—which partially explains why their are so many free samples in life. Hence, giving away something for free is an effective way to influence. You can avoid this influence by distinguishing uninvited gifts from welcome ones. For example, “I didn’t want this free food sample to being with, so I won’t feel obligated in giving you anything in return if I take it. Another thing to beware of are unwelcome concessions; say a door-to-door salesman that asks you to donate a large sum to a cause you aren’t interested in, only to lower the donation amount in the hopes you’ll donate something. The takeaway: Don’t donate unless you want to, not because someone is seemingly compromising. Commitment. If people commit to something, either orally or in writing, they are more inclined to honoring the commitment, even after a change of heart. This often leads to rationalization. The best way to avoid this type of influence is engage your system 2 thinking before making a commitment. And if you ever have a second thoughts about something, even with big commitments like buying a home, backing out might not be such a bad idea if you know the consequences and recognize your commitment as a mistake. Social proof. Humans are sheep. They like to fit in. They’re susceptible to peer pressure, conformity, and heard mentality. As such, they follow crowds. So if you can get large sums of people to do something you want, you can exponentially increase the number of participants. To avoid this influence, you must think for yourself. Not your mother or father. Not your friends or peers. Not society. Do things you want to do. Just know that what you do can affect your relationships. The onus is on you to determine if those relationships are worth sacrificing for. Liking. People tend to buy and commit to things from people they like and are attracted to. If you’re ugly and want to influence someone, work on being likable. To avoid this influence, be objective in the things you commit to. Online shopping is a good example of this, since you get to dictate what interests you. And computers are neither likable nor attractive so it’s usually smooth sailing. Authority. Since most people identify with followers than with leaders, simply being authoritative is a powerful way to influence. You can do this by dressing in an authoritative way (or even wearing an official looking uniform, i.e. mall cop), speaking or writing in an authoritative way, and or carrying yourself in an authoritative way. To avoid this influence, do as the punks say and always question authority with “whys” and further explanation. Scarcity. Scarcity, whether actual or perceived, will generate interest and demand. In other words, “for a limited time only” still works. If you’re the shady type and want to feign scarcity, you can accomplish this with narrow or primed contrasting. For example, displaying only a few available items while knowing full well you have a warehouse full of more. To avoid this mentality, shop at Amazon—which is considerate enough to tell shoppers that “more is on the way” when immediate stock is low. Furthermore, you should do wide searches online or across multiple stores to gauge scarcity and check someone’s claim’s of “limited quantities” before committing. All told, Influence isn’t as insightful or as well researched as Thinking Fast and Slow. 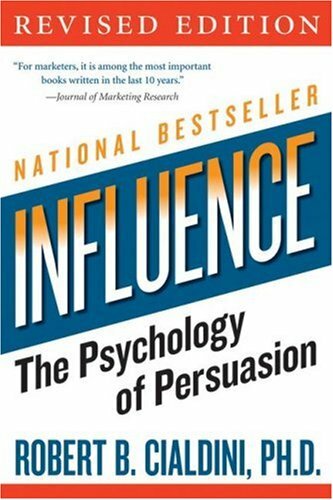 But it’s a helpful guide — if not a “survey course” — for anyone hoping to influence more or be persuaded less.